Please, login or register to use all service features. All schedules are posted by 9:00pm on Wednesdays, but they are not MARKED FINAL until 5:00pm on Thursday. 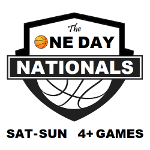 ONE DAY SHOOTOUTS are youth basketball tournaments for boys and girls ages 2nd thru 12th. Travel, school and feeder basketball programs are all welcome (A & B divisions). Registration deadline is 10 days prior to the tournament. These basketball tournaments sell out very quickly! Only 8 openings in each bracket (A or B) ... first-come, first-served! © 2019 One Day Shootouts.